Sign up for Broadjam today to follow Frank Krischman, and be notified when they upload new stuff or update their news! Colaboration between Frank and the brazilian singer Olivia. Recorded in Austin,Tx and Sao Paulo, Brazil. Recorded on Pro-Tools and using file sharing through the Internet, these two artists made an album even being thousand of miles apart from each other. But the results sound incredibly connected and close together. 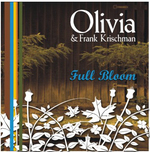 Frank wrote all songs and played almost all instruments and OLIVIA added her cool and melodic voice. She also did the final production and mixing. 5 stars material, just pure, simple and beautiful from their hearts and souls to yours. ENJOY IT ! 2 steps to heaven, won?t you please just let me in. But you did and I will take you home.